Are you getting the most out of your marketing spend or do you feel like your marketing strategy needs a tune-up? ProV3 Media excels in all areas of Digital Marketing: Web Design, SEO, Social Media, Campaign Development and Execution, Analytics & Reporting and Web Video Production. 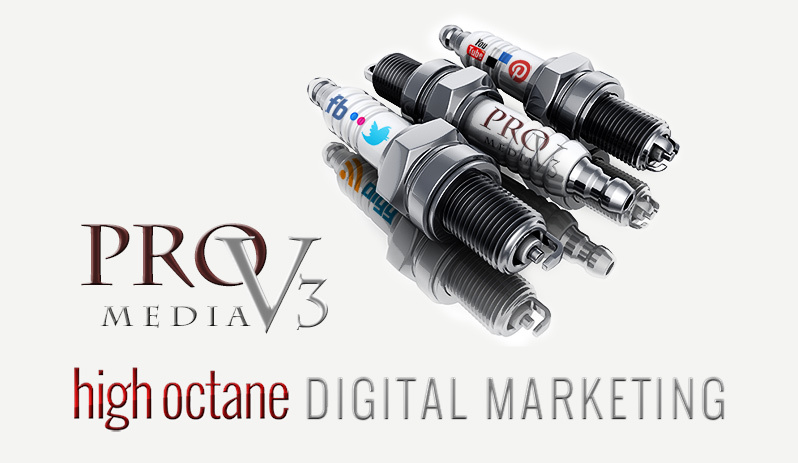 ProV3 Media can develop and manage your entire digital marketing strategy while staying laser focused on achieving your goals and maximizing your marketing ROI. Effectively engaging your customers is absolutely critical to growing your business. Let ProV3 Media show you how to transform your customers into brand advocates through social media. ProV3 Media has over 50 years combined experience at the partner level in technology, consulting and interactive marketing. We know digital and are well suited to manage your entire interactive marketing portfolio. We don’t just design pretty websites… Usability is every bit as important as having a a great looking design. At ProV3 Media, we are fanatical about designing and building exceptional end user experiences for our clients. Rich video content has been proven to dramatically improve customer acquisition and conversion when used effectively in web applications, and we just happen to have a ton of experience in producing the highest quality HD video content.